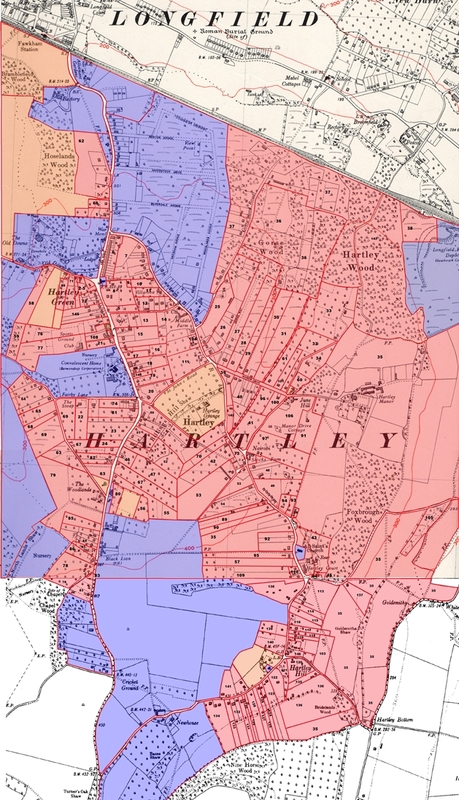 Small Owners Limited bought most of Hartley in 1912. Their aim was to split Hartley up into smallholdings or house plots. The way they split up the old farms has had enormous influence on the shape of modern Hartley. The map is the 1936 Ordnance Survey Map, divided up by the extents of the original plot sales by Smallowners Limited. Click on a number on the map to find details of the name of the buyer, date of purchase, and where known, where the purchaser came from and what their profession was. Areas shaded blue on the map did not belong to Smallowners, while land shaded brown did belong to Smallowners, but we have no details of the purchaser at present. The details show the buyers came from all walks of life and from a wide area. In 1928 the company transferred all its remaining land to the company secretary Jane Foote Maxton (number 35 on map). The Glen, Briars Way etc.